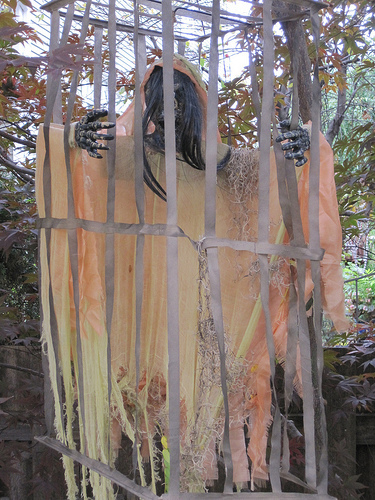 I caught Death in a cage in the backyard. It was mostly an accident. The cage was supposed to be a trap for ghosts but it didn’t work the way I expected it to. Death looks like a sunset that got torn up by the cat. I thought death would be darker, or heavier. Bits of sunset float and curl around the bars and almost glow, but not quite. At first Death was very quiet, then it started making a low humming sound but after awhile the humming turned into words that felt like music in my head though I could never remember what they said. The cage didn’t last long since it was made of paper, the wind and a little bit of rain pulled it apart until it looked more like streamers than a proper cage. I couldn’t tell when Death left exactly, it was there and then it felt like it was still there but it wasn’t anymore. Even though Death is gone I can still hear it in my head.